The importance of well prepared coils for the processing of any stator is vital. Well layered wires resulting in the build up of tidy and balanced coils is key, especially for the coil inserting process. Our range of coil winding machines include arbor coil winding machines which can handle winding up to 60 wires in parallel, shed coil windng machines that wind coils direcly into transfer tools and fully automatic coil winding and transfer systems that wind coils directly into the coil insert tooling for high volume production. Our coil winding machines will meet the needs of every customer. 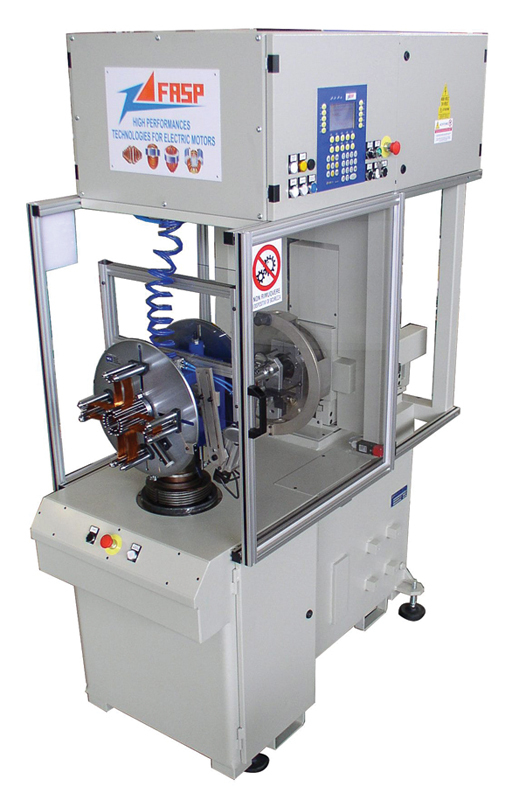 The Samatic familty of arbor coil winding machines include the 1002, 2002, 3002 and 4002 models. All of these models are extremely well built and from a solid and sound manufacturing base. 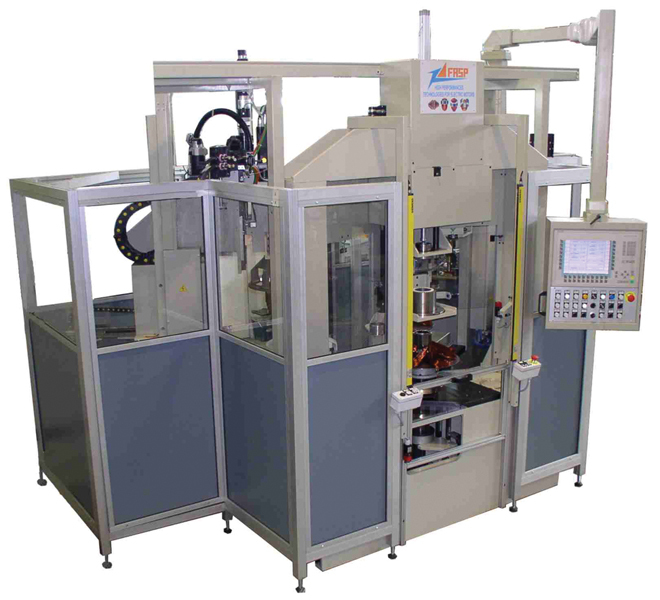 The automatic wire guide system supplied with every machine gives superb layering of the wire in the coil former chambers resulting in no crossovers of the wire being wound. This give a huge advantange for the next process, coil inserting. Samatic coil winders can be used to produce constant pitch coils, concentric, diamond shape coils and even coils wound with flat strip wire section. From a single wire of 0.2mm up to a maximum of 60 wires of 1.5mm our standard coil winders can handle all winding specification. The minimum coil size you can produce is 30mm up to 1,500mm on our largest 4002 coil winding machine. It is possible to purchase a wide range of standard coil formers which will satisfy all major production requirements for electric motor coils. Loading and unloading of the tooling is very simple and straightforward so the downtime for the machine is minimal. The machines are easy to set up and use and would be ready to start in production from the moment they are arrive on the shop floor. From standard coil winding machines which requires an operator to manually unload the coils from the winding machine, we progress onto shed coil winding machines. 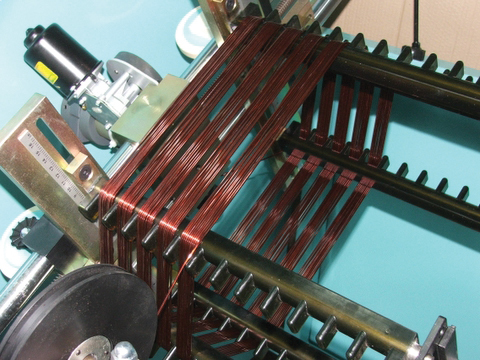 A shed coil winding machine will automatically wind sets of coils directly into a transfer tool. This transfer tool is then taken by an operator and loaded into the coil inserting tooling. This speeds up the process of coil transfer to the coil insert tooling. The FG series of horizontal shed coil winding machines are all supplied with a PLC servo controlled operating system giviing high performance, great flexbility and superb reliability to every production line. Flyer speeds of up to 3,000 r.p.m can be reached and changeover times are quck and easy. For a stack height change you only need 5/10 minutes and for a complete lamination change, 20 minutes. 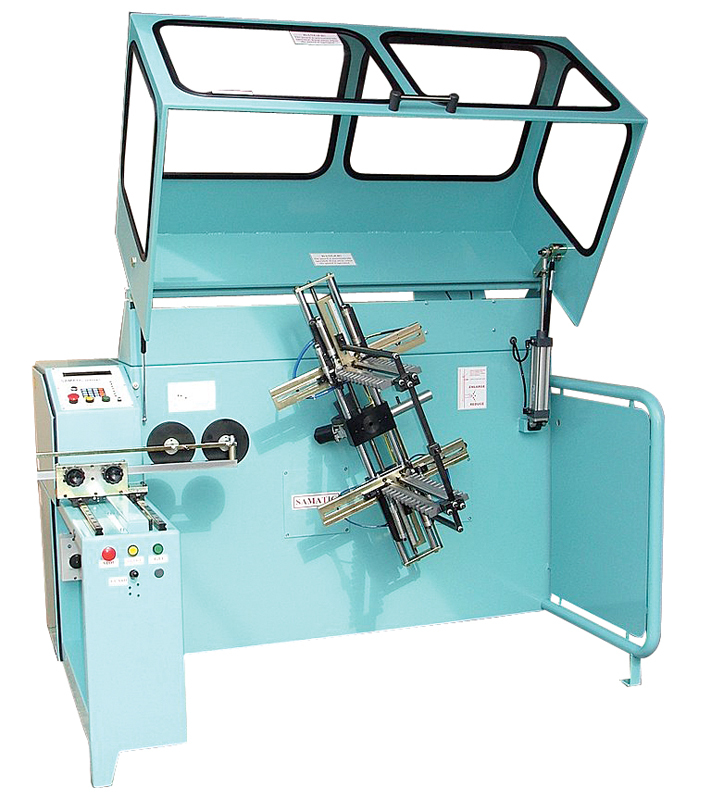 All shed coil winding machines have good wire tension control and can be supplied with automatic wire cutters and wire break / run out devices to stop the machine and reduce the amont of potential scrap copper. Stator coil sets for frame sizes 56 - 315 can be processed through the FG series coil winding machines. Excellent preventative measures have been designed into all of the FG series coil windng machines to avoid any major breakdowns therefore minimising production down time. The TAV group of fully automatic vertical coil winding and coil inserting transfer systems give the ultimate production outputs. A TAV vertical stator coil winding and coil inserting system will be tailor made to suit your own production needs and will incorporate multiple coil winding and coil inserting stations to meet the outputs levels required. Each system is PLC servo motor controlled for high accuracy and repeatibility for all machine and tooling movments including automatic slot wedge making.